Middle graders enjoy "problem novels" -- they teach them about the world and the issues that others face. In the case of Paper Things, the issue is homelessness, although our protagonist, Ari, doesn't think of herself that way. Ari and her older brother Gage are "between homes." After their parents' deaths, things didn't work out with their guardian, so they drift between the apartments of Gage's friend, girlfriend, and the occasional shelter. Once a start student on her way to the middle school for gifted students, now Ari struggles to get her work done and to keep her uniform and herself clean. Through it all, she keeps a positive attitude and hopes that things will work out for her family. 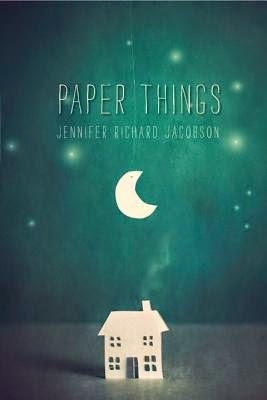 Paper Things is a great novel for teaching empathy. At one point, Ari is teased for having greasy hair. If the students had known that it was because she was sleeping in a homeless shelter, they never would have said anything. I hope it makes readers put themselves in some else's shoes before lashing out with unkind comments. I'll be passing this off to my students who enjoyed Rain Reign and Okay for Now. I think this thoughtful portrait of homelessness is worth sharing.